A Glasgow-based waste management firm is the latest leading Scottish resource management company to sign up to Scotland’s Resource Sector Commitment, it was announced today. 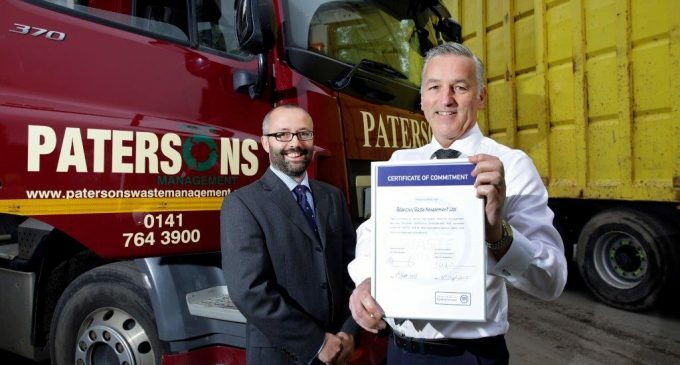 Patersons Waste Management Ltd has been recognised for its commitment to the national kite mark for quality customer service for the waste and resources sector. Revealing the news at the event, Andrew Dickson, Resource Sector Manager at Zero Waste Scotland said: ‘It’s terrific news that another leading Scottish resource management company has signed up to Scotland’s nationally recognised mark of excellent customer service. General manager at Patersons, Ian McArthur, commented: ‘We are delighted our work has been recognised by Zero Waste Scotland by becoming a signatory to the Resource Sector Commitment. A kite mark for resource management companies, Scotland’s Resource Sector Commitment requires signatories to demonstrate consistent standards for business waste collections and excellent customer service, including the promotion of resource efficiency to its customers. Aimed at any organisation involved in providing waste or resource management services to commercial customers in Scotland, the commitment includes local authorities, private and third sector resource management businesses, and resource management associations and trade bodies. Visit www.zerowastescotland.org.uk for more information.